If you carry around an iPhone as your smartphone of choice then the Apple Watch is hands-down the best option for a smartwatch, for the seamless integration if nothing else. But what about the rest of us? You’ve got more options than you might realize for a companion wearable, and we’re going to get into the pros and cons of each. While smartwatches might not have reached as many wrists as some manufacturers would’ve liked, they can still be very useful in a lot of situations: Unshackling you from your phone on the daily jog, checking incoming texts on the bus, getting alerts when the weather’s about to turn. You can even text with people in the movies and not offend the entire theater. If you’re thinking about dipping your toes (or rather wrist) into the world of smartwatches, there are three smartwatch makers and one smartwatch platform you need to consider. Here’s how they stack up against each other. Wear OS isn’t in a good place right now, but we’re seeing some green shoots of recovery in a barren wasteland: New chips from Qualcomm, new flagship watches from LG and Google (according to the rumor mill), and maybe enough momentum to make Google’s smartwatch platform a serious contender again. Let’s start with the positives. You can get Wear OS on watches in all kinds of shapes, sizes, and styles. Like Android phones, you get the biggest choice of designs and hardware, with fashion brands joining tech manufacturers in churning out wearables. This will only remain a positive if new Qualcomm chips can kickstart some more innovation, though. Google is reportedly working on a Pixel smartwatch, and if the likes of LG, Huawei, Lenovo, Fossil and others keep on releasing new devices then Wear OS runs rings around its rivals in terms of variety. That choice extends to apps too. Google has apps like Keep and Maps optimized for Wear OS, and big names such as Facebook, Strava, Spotify, Uber, Citymapper, Telegram, Todoist, IFTTT, and others have all made efforts to support Google’s smartwatch platform (offering interactive notifications at least, if not standalone apps). Throw in the multitude of third-party watch faces you can get for Wear OS—plus tools that let you easily design your own—and you could argue software development is stronger than it is on the Apple Watch. With Google Assistant now getting smarter on Wear OS too, you can do a lot on these devices, even if you still need your phone to stay close by for a lot of the time. So what’s the problem? 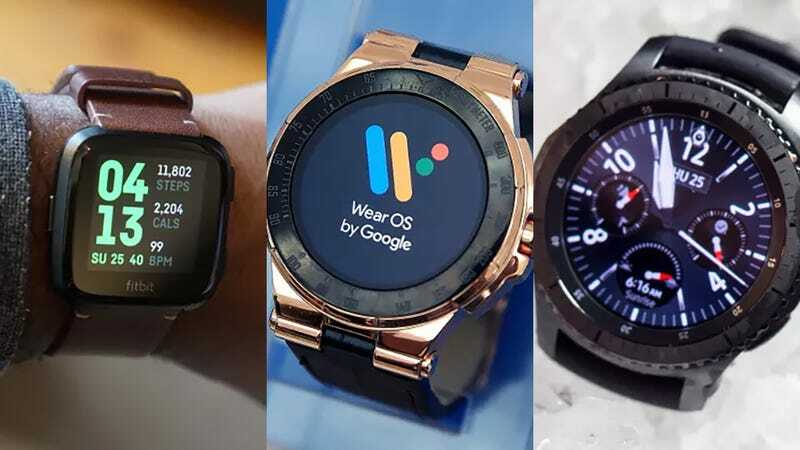 Despite the abundance of Wear OS devices, not many of them are all that compelling in terms of style or performance, and they’re all starting to show their age as we wait for new internal components to arrive. Manufacturers may or may not pick up the baton in the months ahead, but if they don’t, that’s a serious issue. We’ve also noticed occasional crashes and other bugs with Wear OS devices, again a symptom of hardware that’s getting out of date. Wear OS has a chance of shining again, with enough investment from Google and others—but in mid-2018 it’s hard to make a convincing case for picking up one of these smartwatches. Fitbit is the dominant player in fitness wearables and quite fancies getting a slice of the smartwatch market too. It’s even gone so far as to bring out the $200 Fitbit Versa, a Pebble-ish wearable that boasts half-decent aesthetics and doesn’t feel like it belongs in some low-budget 80s TV sci-fi show (looking at you, Fitbit Ionic). Various other Fitbit trackers can display the time on a tiny display, and even alert you to texts, but let’s consider the Fitbit Versa more or less on its own as an Apple Watch rival. What you should know first is that Fitbit likes to keep everything in-house, which means its own apps, its own watch OS (with a little help from Pebble), and no integration with the likes of Google Fit or Apple Health. In other words, you’re stuck in Fitbit’s walled garden—great if you like it, not-so-great if you don’t. There’s no doubt the interface here is one of the best around, with everything feeling intuitive and looking polished on the 1.34-inch screen. It also does a brilliant job of keeping fitness stats on screen alongside the time and date. All your fitness data, including sleep and heart rate tracking, is fed back to Fitbit’s mobile apps, which are some of the best in the business. You can dig into your stats in all kinds of ways, set goals, configure specific workouts and much more – like the Apple Watch, the Versa excels as a fitness tracker, as you would expect from Fitbit (though the one key omission is no on-board GPS). You can of course get push notifications from pretty much any app on your phone. What you don’t get is any real interactivity, or indeed any standalone apps designed for the Fitbit Versa specifically. The biggest names on board at the moment are Starbucks and Flipboard, so you can’t load up Facebook Messenger or Google Maps or Spotify as you can on a watch running Wear OS. Those limitations spill over to watch faces too. Wear OS may be a long way from perfect, but there are a ton of customizable watch faces you can apply, and it’s not at all difficult to design your own watch faces either. Fitbit and third-party developers do offer a reasonable selection of watch face choices, but it’s nowhere near as wide as Wear OS, and you don’t get as many configuration options either. The Fitbit Versa looks the part, is affordable, and excels as a fitness tracking device with basic support for notifications. If that’s all that matters to you, it’s a fine choice. For serious, big-name apps that run on the watch, plus easy integration with other third-party apps and services, you’re going to need to look elsewhere. Samsung continues to merrily plow its own furrow in the smartwatch space, which probably annoys Google quite a bit, as the Galaxy wearables are consistently well designed and slick to use. Get one of these devices running Wear OS and we’d hands down have one of the best smartwatches around. The $280 Galaxy Gear S3 leads the way for Samsung (a Gear S4 is expected later this year), and there’s also the $300 Galaxy Gear Sport, offering something more fitness-focused and a little smaller. Both these watches run Samsung’s own Tizen OS, which presents us with the same problems we noted with the Fitbit—an impressive interface, but little in the way of app support. Samsung has signed deals to bring support for UA Record, MyFitnessPal, Endomondo and Map My Run to its watches: The implementation is often rather clunky, but they help turn the Gear watches into serious fitness trackers as well as devices that tell the time. However, you can’t do anything like call an Uber, or see step-by-step Citymapper directions on your wrist, as you can with Wear OS. One area where the Gear Sport (but not the Gear S3) shines is in offline Spotify support—as in, you can play songs through Spotify right from the device, rather than just controlling Spotify playback on your phone. It’s a shining light in an otherwise dim picture for third-party app support. Meanwhile, Samsung’s own software is slick and helpful, on the watch at least, and you can bring up phone notifications, fitness statistics, calendar appointments and more very easily. There’s also more interaction available than there is on the Fitbit Versa, at least with the basics like calls, texting, and emails. The story is largely the same as it is with Fitbit—strong in terms of design and on-board software, weak in terms of third-party app support and actually interacting with your phone. Tizen OS is a little more polished than the Fitbit OS at this stage, though Fitbit’s mobile and web apps are better across the board, with Samsung users stuck with Samsung Health (shudder). If apps, Google Assistant, and Google support matter a lot to you, hang tight for more Wear OS hardware coming soon, possibly. If you want a watch that’s great now—and particularly if you want something to do a stellar job of tracking your various fitness metrics—then you’ll have to think long and hard about going for Fitbit or Samsung. Just don’t expect to be getting walking directions or calling a cab from it anytime soon.